I'm spending a couple of days in St. Louis on a work trip, and this morning took a quick run along the Riverfront Trail, which winds its way through downtown St. Louis along the banks of the Mississippi River. It's hard to fully capture the importance of the Mississippi River in American history, or in the American imagination. Who among us hasn't read The Adventures of Huckleberry Finn and envisioned Jim and Huck, making their way down the mighty Mississippi? Or teared up listening to Paul Robeson's resonant baritone as he sang "Old Man River"? It was hard to just stay "in the moment" this morning as I ran along the riverfront, aware as I was of the deep history of this place. As early as 1050 AD, the Mississippian people had settlements here, and constructed burial mounds in what is now the city of St. Louis. By the 1760s, French explorers like Louis Jolliet and Jacques Marquette passed through St. Louis as they explored the North American continent. 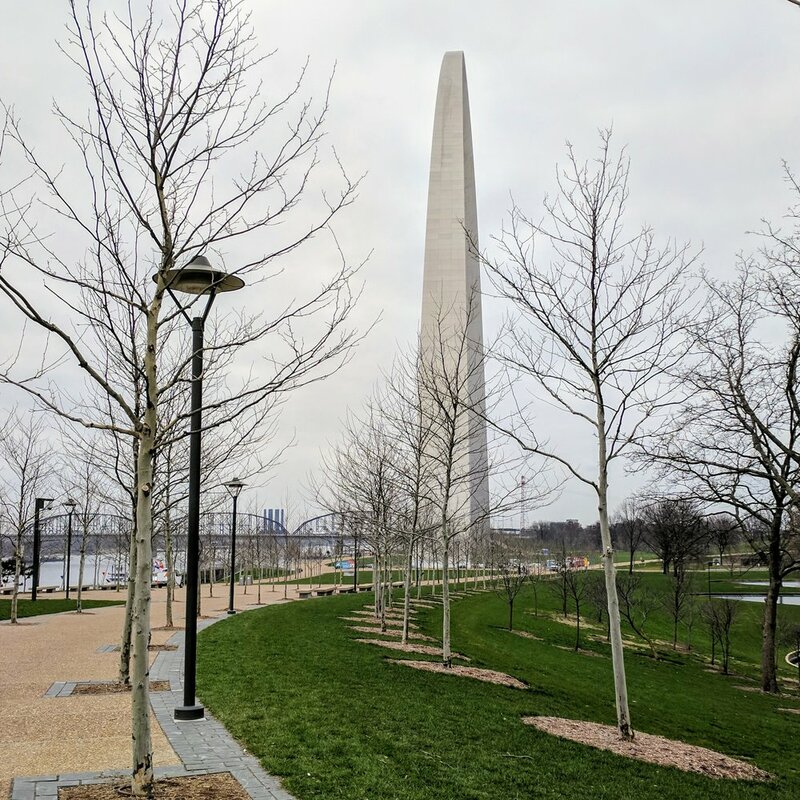 After the 1803 Louisiana Purchase, the Port of St. Louis became part of the United States, and Lewis and Clark's expedition departed on their great expedition across the West from here, in 1804. 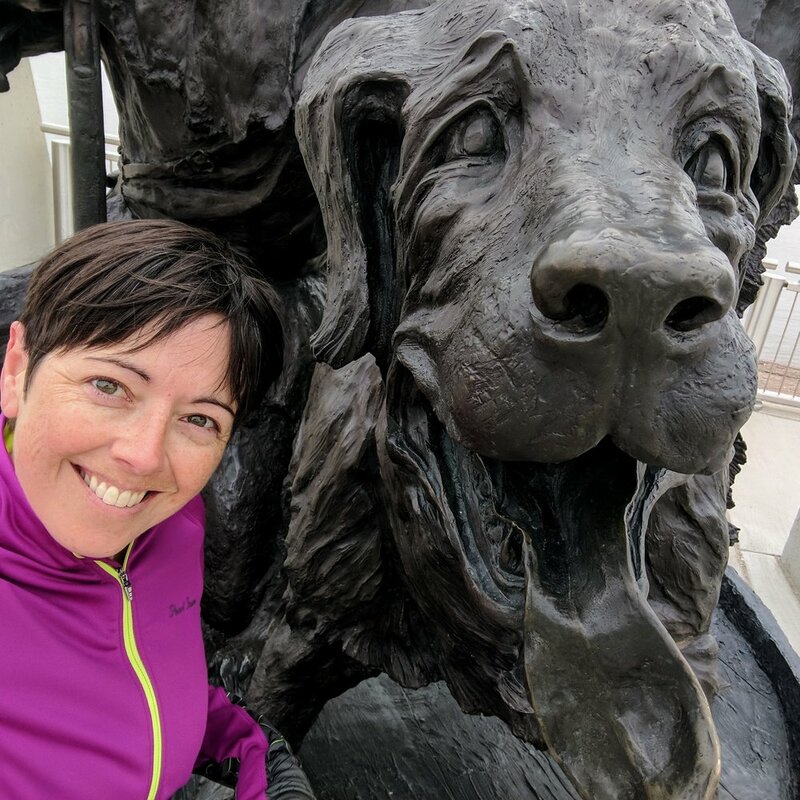 A statue here along the waterfront commemorates the safe return of Meriwether Lewis and William Clark (and Lewis' dog, Seaman, who accompanied them on their journey) on September 23, 1806. 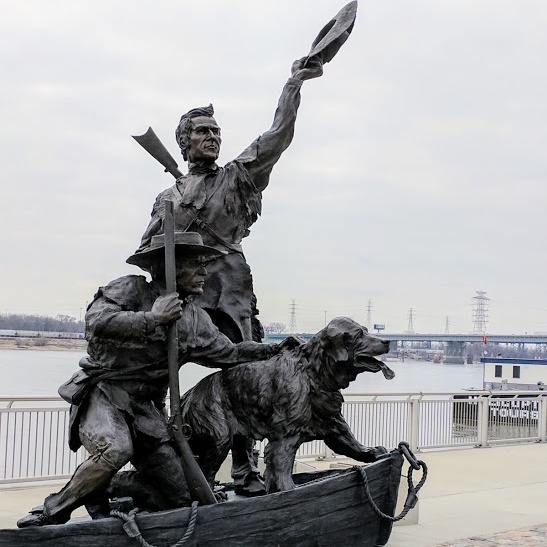 I love that Seaman is so enthusiastically depicted in the sculpture that commemorates the successful return of the Lewis and Clark expedition. 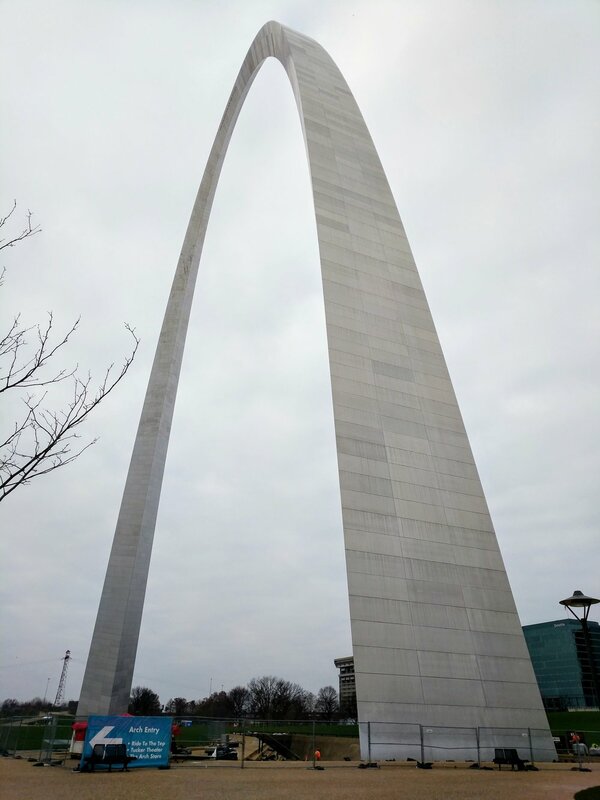 The Gateway Arch itself, which has become such a potent symbol of St. Louis, was built to commemorate the Louisiana Purchase and the subsequent exploration of the West, including the Lewis and Clark expedition. In its beautiful simplicity, it continues to inspire. As the first steamboat arrived in 1817, St. Louis boomed as a major port. Right near this spot, in 1835, stood the press of Elijah Lovejoy, whose anti-slavery newspaper, The St. Louis Observer, fearlessly told the true story of lynchings and other racist hostilities, long before the Civil War. This spot also marked the start of the Overland Mail Company's route, where starting in 1858, Wells and Fargo guaranteed stagecoaches would get mail to San Francisco in under 25 days. I could go on and on about the pivotal role the city of St. Louis played in American history, but I'll stop here... just to say that so many decades of people and events were sloshing around in my mind as I ran along the waterfront this morning, I was more aware than usual of all the historical complexities of this place. Happy travels, friends... and see you on the trail!